Stellar jazz singer Vimala Rowe will be appearing at Swaledale Festival for the first time this year. Partnered by the gifted and versatile guitarist John Etheridge, Vimala’s sophisticated and soulful vocals will be heard in the Cloister Room at Tennants Garden Rooms in Leyburn at 22:00 on Wednesday 7 June. Tickets are £15 for adults and £3 for under 25s. 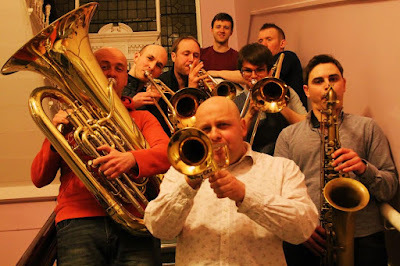 The massively funky brass and drum band from the North-East makes its first Swaledale Festival appearance at 19:30 on Monday 29 May in the delightful church of St. Oswald’s in Askrigg. The programme will include specially written pieces as well as classics from the New Orleans brass band tradition. Tickets are £16 for adults and £3 for under 25s. As part of this year’s Swaledale Festival, NYJO will perform a special concert in Richmond’s newly-refurbished Influence Church (formerly the Zetland Cinema) at 19:30 on Monday 5 June. Directed by Mark Armstrong, the band will perform classics from the Big Band era alongside brand new compositions. Tickets are £18 for adults and £3 for under 25s.